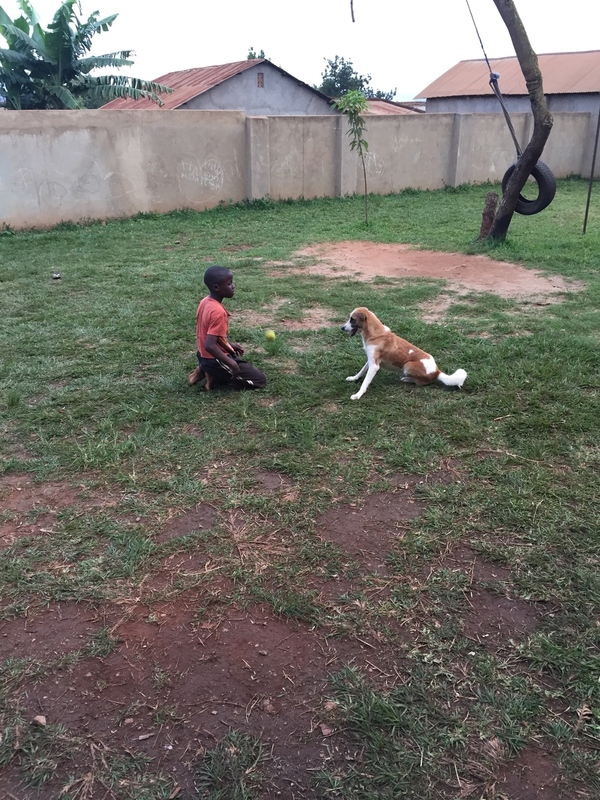 When we arrived at The Center in January, there was a dog staying in the back garden. Annet, the landlord’s sister, had asked us if we wanted it and we graciously declined, not quite understanding what this would mean. Prior to us moving in, Joel and his mother, another sister to the landlord, lived in the house. This meant that Joel's precious pup, Poppy, also stayed at the compound. When we arrived, Joel and mom had to move, leaving Poppy behind. Without a family or place to stay, Poppy came to call the enclosed garden in front of The Center her new home. Much to our disappointment, this virtually meant that Poppy lacked the love and attention that she once received. She was stuck outside during rainstorms and often didn't get food. We would hear her cry all day and all night. The whole thing was heartbreaking, so we decided that we had to intervene. We demanded that she be let out of the garden and offered to take care of her at The Center, her original home. We were horrified to see the condition Poppy was in. She had an injured paw, was filthy, covered in fleas, her ears were bleeding from fly bites, and she was very hungry. We called in a vet to clean her up. He treated her for all the above ailments and then vaccinated her for rabies. We started feeding her and, likewise, she started adjusting. This went on for a few weeks before one of the kids from our programs informed us that Joel was the actual owner of Poppy. I grabbed Joel and eagerly inquired. She was indeed his dog, so I asked him, "Joel do you know where Poppy is now?" (We had already had her for about a week at this point.) He sheepishly pointed towards the back of the house, where Poppy hangs out during our kids programs. I replied, "If this is your dog, why is she living at The Center with Action in Africa and why are we are feeding her?!" He uncomfortably giggled. We then began to discuss the situation, and it quickly became clear that his new home was not suitable for Poppy. The house was too small and is surrounded by many aggressive neighborhood dogs. Joel worried that Poppy would get ganged up on by the other dogs and might even end up dead. His best solution was to keep Poppy locked in the garden away from harms way. Given the circumstance, we agreed to continue caring for Poppy if Joel agreed to help us with her. So now he comes over to play with Poppy every evening in the yard, as well as to bathe her every week. The amount of time and attention Joel gives to Poppy clearly demonstrates the strength of their bond and the depth of his love for his sweet little puppy. Each evening when they are running throughout the yard, I often wonder whether Poppy or Joel is having more fun! It has been such a joy being able to provide for Joel's dog in ways that he couldn't himself. We are honored to play a role in this situation and to watch both Poppy and Joel thrive together! Newer PostEnd Of Holiday Bash!